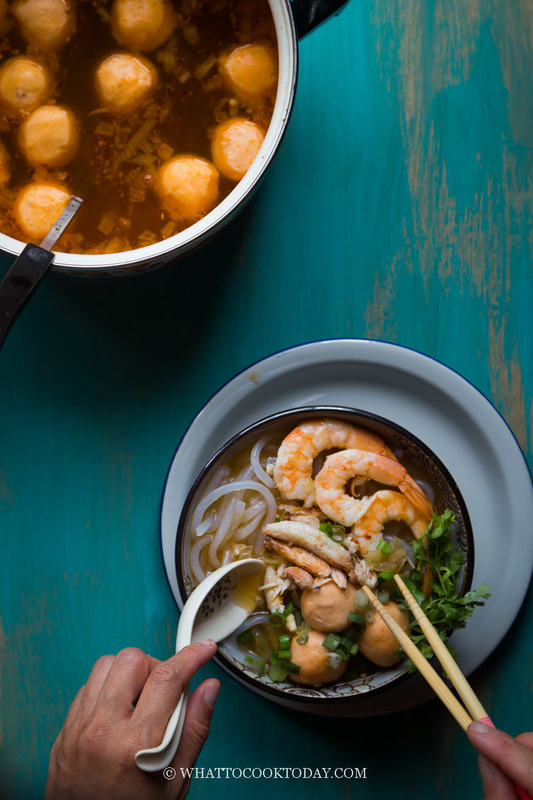 Seafood lovers will surely enjoy this Vietnamese Banh Canh Cua Tom served in thick umami-rich broth topped with succulent shrimp, crabs, shrimp balls. I’m sharing the easy version too. I’m seriously a noodle addict like beyond help. Actually, I don’t want to be helped! It doesn’t matter if it’s winter of summer, I always make room for noodle soup. Perhaps I grew up in a tropical country where it’s warm all year long and yet people are slurping noodles while sweat is rolling down their faces and backs. Anyway, another delicious Vietnamese noodle soup I think everyone must try is this banh canh cua tom. 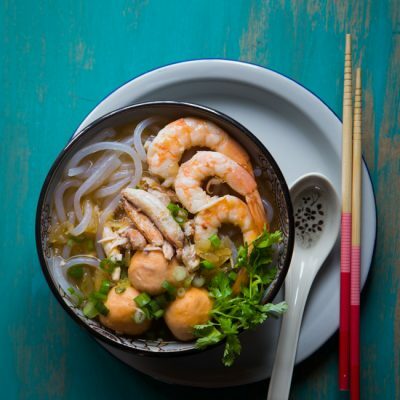 WHAT IS BANH CANH ? 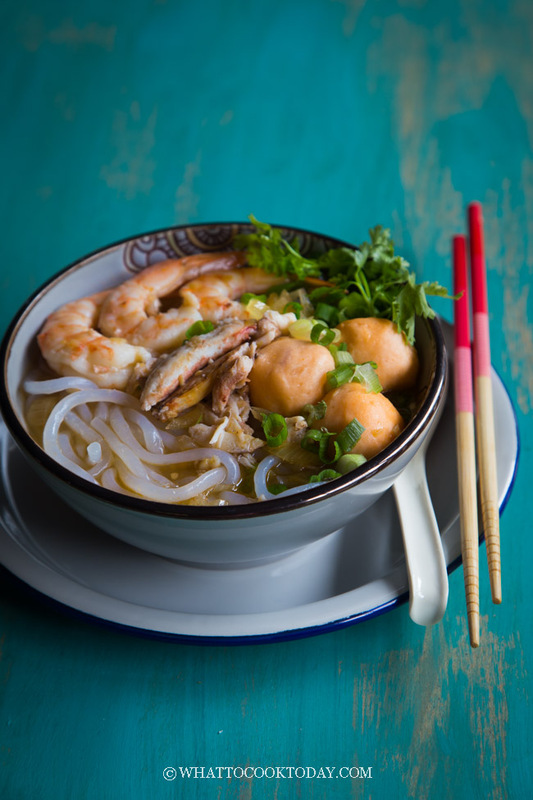 Banh canh is a thick noodle that is made with tapioca and rice flour combination. Depending on the ratio of tapioca to rice flour, more tapioca flour will give you a more chewy texture while rice flour will give a more softer noodles. It looks like udon, but udon is made with wheat flour. 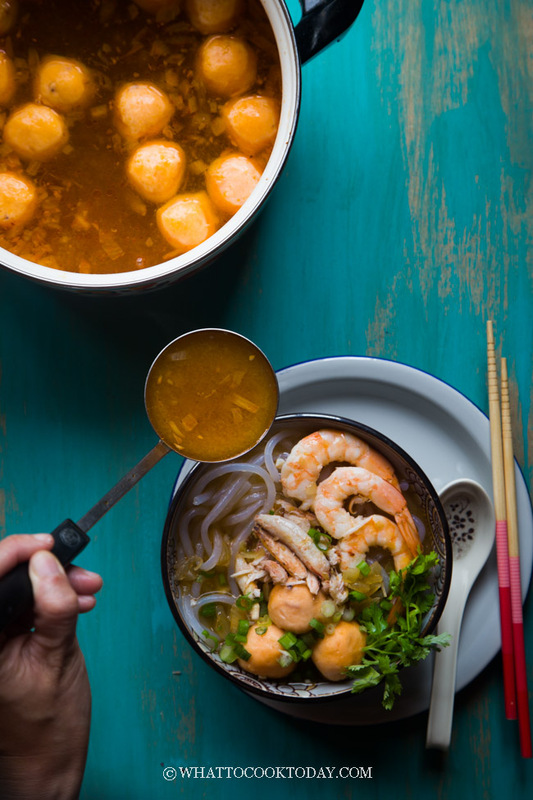 Banh canh certainly reminds me of the khao piak sen noodles I made a while ago. 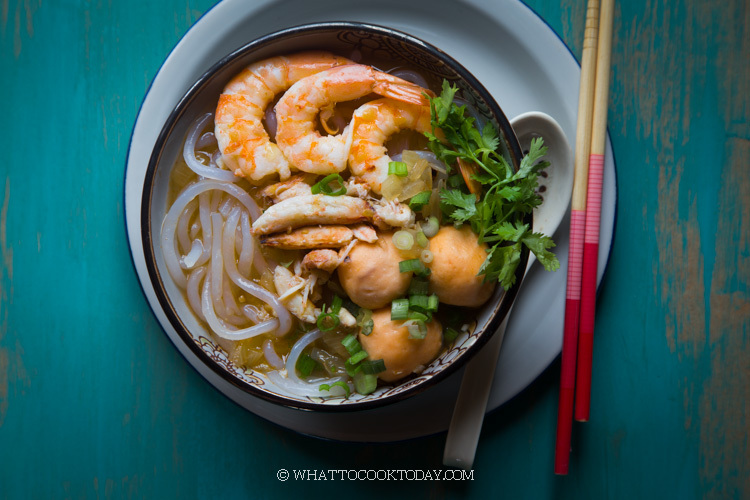 Banh canh is readily available at Asian grocery stores. If you want to make a fresh one, use this khao piak sen recipe. So, my Vietnamese friends, please don’t bite my head off for taking some short cuts 😉 I’m pretty happy with the result without having to slave at the kitchen all day. Though, some days I do love to subject myself to that kind of torture!! DISCLOSURE: This post contains affiliate links, which support this site at no extra cost to you. Learn more. The crab paste adds that extra depth of flavor to the soup base. 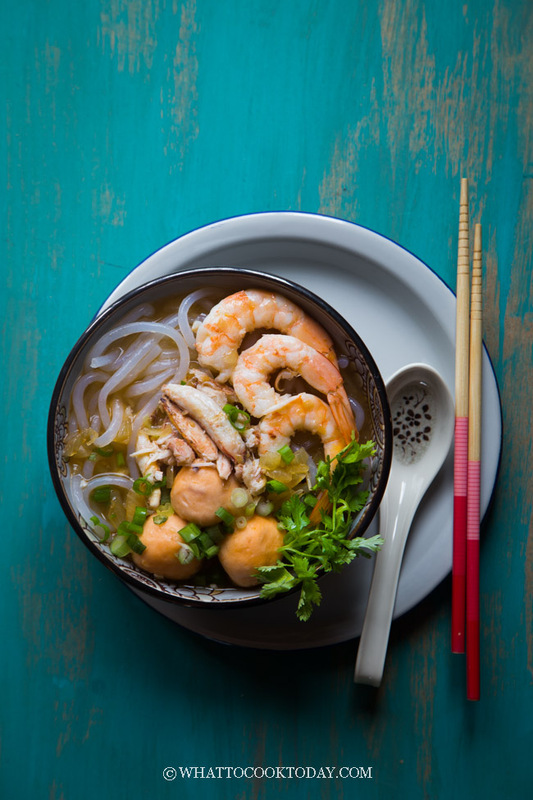 Seafood lovers will surely enjoy this Vietnamese Banh Canh Cua Tom served in thick umami-rich broth topped with succulent shrimp, crabs, shrimp balls. I'm sharing the easy version too. Preheat the oil in a small frying pan over medium heat. Add in the annatto seeds and fry for about 2 to 3 minutes and keep stirring to avoid burning the seeds. Remove from the heat and strain the oil into a glass container and discard the seeds. 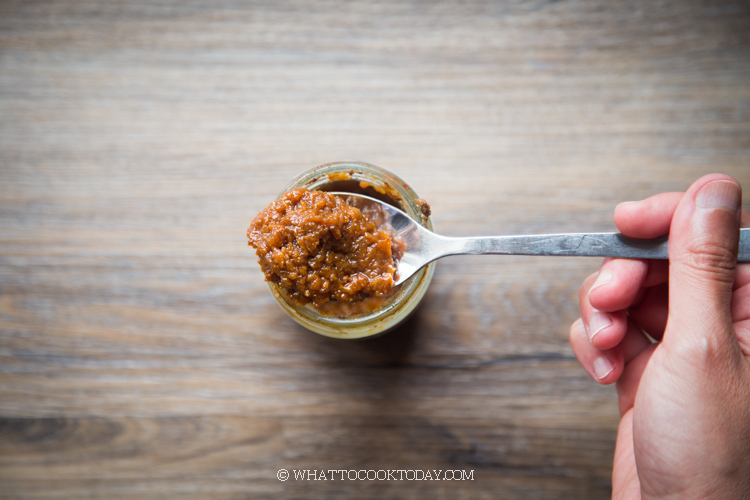 The annatto seeds oil will give the soup its redish color without affecting much of the taste. It's commonly used in Mexican cuisines too.